It's well over a year since I started my notebook on seasonal colour. Intending originally to document a single year of plant colours, I've been encouraged by the increasing numbers of visitors to my blog as well as the enjoyment and knowledge I've discovered in doing it. Thank you :) to the people who have given me plants and other specimens(!) or emailed/told me how much they enjoy my posts - Much appreciated. 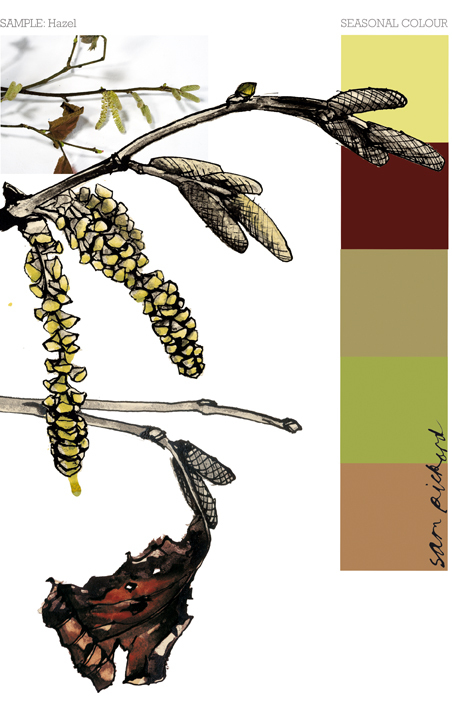 Catkins, I posted their colours last year and today just had to draw them. "A unisexual inflorescence, consisting of rows of apetalous flowers ranged in circles along a slender stalk;" - Shorter Oxford English Dictionary. That's what the dictionary says! I say, look out for the brightest green/yellow colour of their tails against a blue January sky and it will put a spring in your step - it did mine..! Look closely at the tall Sedums at the moment and you might notice that shoots are sprouting up from the base. I noted a few of the colours of these last year on 24th January, so I know that the fresh growth this year isn't early despite the warm weather. The colours of the rusty old seed-heads and verdant young buds are looking good again together. Not much to say about them except they thrive in drought, do ok in the wet too and so undemanding they really do grow on you! 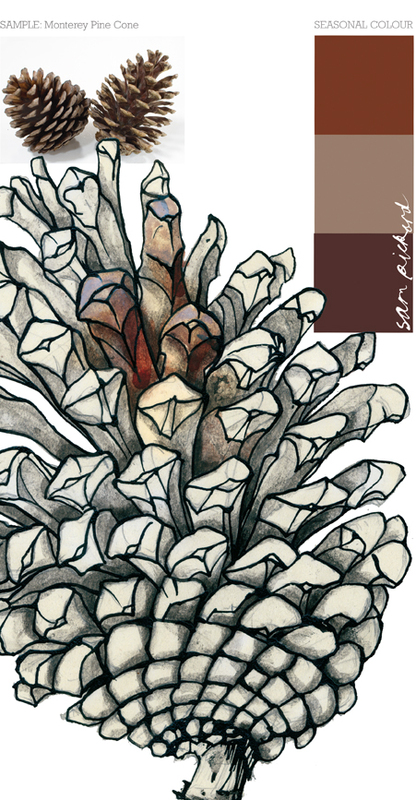 Mixing up paints to add colour detail to this drawing, it occurred to me how easy I find it. It goes back to my degree at Camberwell when I didn't have a lot of money to buy paint so I mainly bought the three primary's. I usually got ultra marine, crimson red and lemon yellow, as well as (and essentially) black and white. If I could I would also get yellow ochre, burnt sienna and raw umber, but I could make do without these as you can mix every colour from the primary's plus black and white - it was just quicker to be able to add ochres and umbers to get olive greens etc. Since I began this notebook, I've lost track of the number of plant colours that I've matched to printed CMYK (Cyan, Magenta, Yellow and Key (Black)). 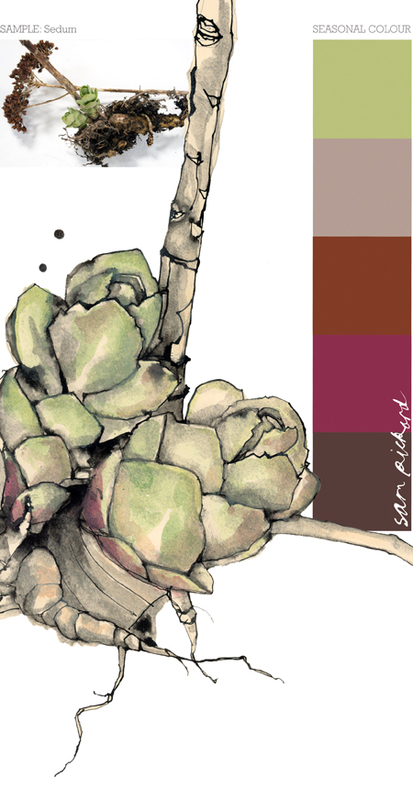 I've now got detailed information with which to mix up hundreds of plant colours. 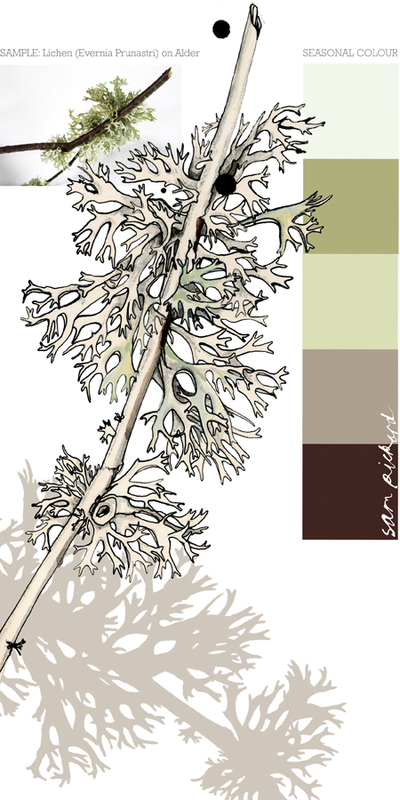 For example Lichen green2 (below) has 10% Cyan, 0% Magenta, 55% Yellow and 30% Black. This knowledge makes mixing colours easier still and what's really great is they will print accurately as well. 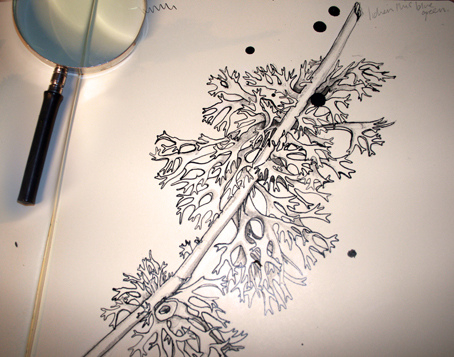 I've sampled some of the colour I found in Oakmoss Lichen before but this is the first time I've tackled drawing it. It was as hard as it looks and I had to use a magnifying glass to look for the detail. 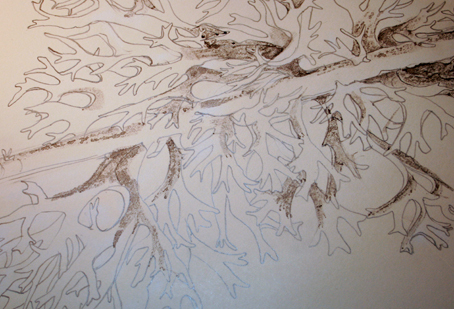 Reminded me of a deer's antlers - the shadow of the drawing is especially striking. 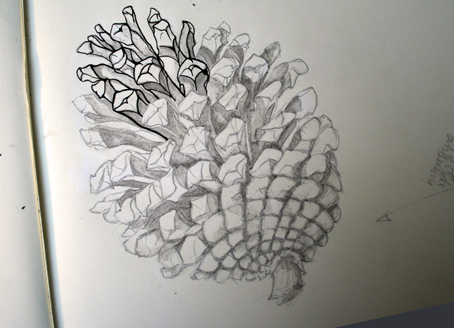 inked in drawing - a few blots but nothing too serious. Stormy weather here and the large Monterey Pine cones from the huge tree at Heddons Mouth are scattered on the ground - they can stay attached to the tree for over 30 years which is quite remarkable! 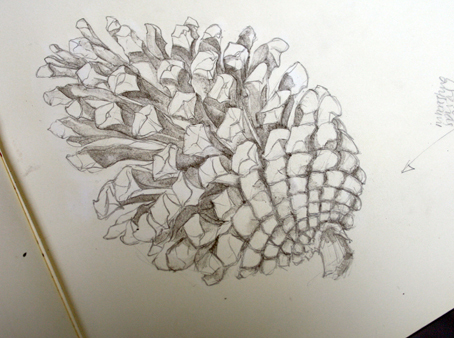 The intricate overlapping spiral patterns in the cone (which follow the Fibonacci series) are difficult to count and tricky to draw, because it's just so easy to lose sight of where you are on the clockwise spiral and then having to continually cross check that you are still in line with the counter clockwise spiral. 1-1-2-3-5-8-13...Phew! 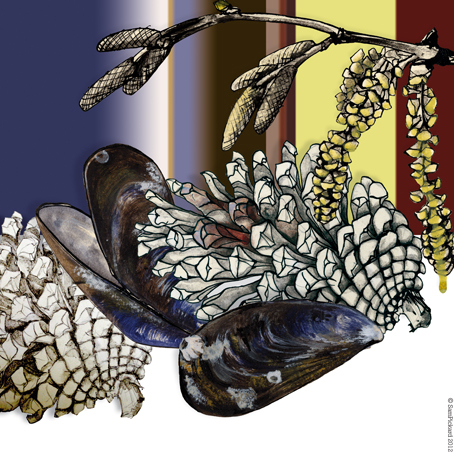 Here are the colours from these cones. the little things - not too wet to Woooo! This year I've been developing a range of products, what with one thing and another going on it's taken longer to get this up and running than I had anticipated, partly because I decided that the range would be hand screen printed here in our North Devon studio and that involved quite a lot of setting up, but also well..because I'm quite a perfectionist, and I wanted the collection to be very special! I decided to return to screen and digitally printing the products myself, they are therefore individual, exclusive and have the quirky differences of the handmade. All the materials are of the highest quality and sourced in the U.K. wherever possible. I also use unbleached materials wherever I can as a positive environmental choice. (Designed and printed by Josse and Sam Pickard). 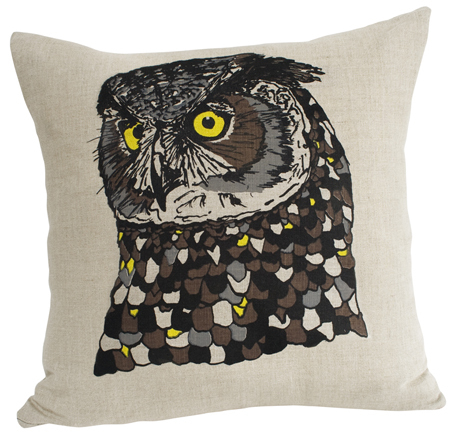 Top image: Wood Panther Moth one of 4 prints bringing the 'Night and Day' series onto cushions. All are now available on my online shop HERE, and we ship anywhere in the world! The little things - New Year New Nibs! ...finally getting around to buying some new nibs for my dip pens. 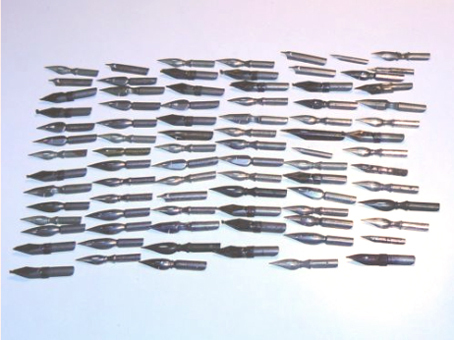 I spotted these on ebay - described as vintage, they were from Hungary and there were 84 nibs in total. 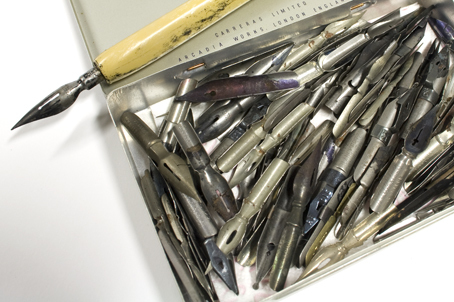 I'd worn my old nibs down so badly from use, that they were looking like this - not good. 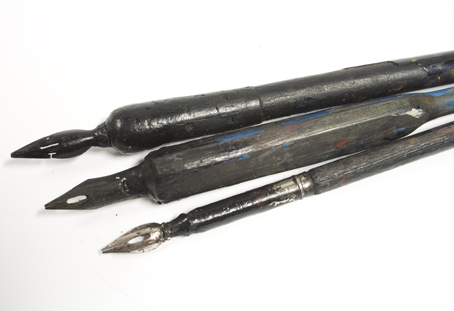 The nib holders are worn out too - the top one is cork and wood under all that ink. 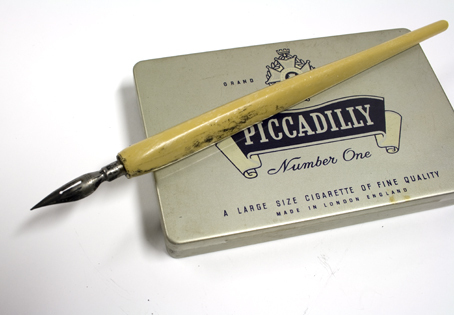 a better nib holder than this bog standard plastic one).